11:30am - Pete has a gig at a restaurant in the Town of Idyllwild. He picked me up, and we both drove together to that town. I'd never visited Idyllwild, best as I recall. This is a busy place. And a happening town! The Pacific Crest Trail crosses a road close to Idyllwild. Hikers take a rest here. Lot of tourists here too. The place is jumping! Pete moved his equipment [amplifier, speaker, guitar] into the restaurant. I found that lots of people know Pete here. He's a popular guy. Then, Pete began to entertain. Note: This was supposed to be a video recording experience for me. It turned out to be an iPhone learning experience. What happened was, my iPhone's storage was pretty much maxed out. I'd never paid attention to that. So, I did not have the opportunity to record hardly any of Pete's songs. When the storage in the iPhone went to zero, the camera just stopped recording. The song above, cut-out before the finish. Turns out that iPhones do not behave when an owner does not know how to do it right! The sun goes down this evening at 7:15pm. iPhone wanted outside, so of course George went with him. First iPhone captured a pic of the long-term RV storage area. 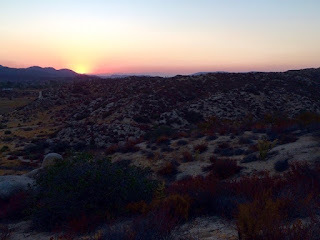 Then we sat together at the fence line of the park, waiting for the moment of Sunset. Here is what we captured. Not great. Sky at horizon hazy. May be better next time. PS: Here's a pic of the front entrance sign at Jojoba Hills RV Resort. I do not know the rationale behind the six month regulation. But government doesn't have to make sense. It's the government! PS: Escapee leaders here at Jojoba Hills, don't enforce the six month rule. That's what I was told. I wonder what was the reason, or the purpose, of this regulation? After six months staying at an RV park [as I understand the regulation] it is necessary to be gone from the park for two weeks. This is not a big deal for me. However, for some at Jojoba Hills RV Park, it may be a BIG deal. A. Persons occupying vehicles with total hook-up capacity, including sewer, water and electricity, shall not occupy any space in a recreational vehicle park for a period exceeding 150 days in any 12-month period, nor shall the cumulative occupancy by such persons of different spaces within the same recreational vehicle park exceed a total of 150 days in any 12-month period. B. Persons occupying vehicles with less than total hook-up capacity shall not occupy any recreational vehicle space in a recreational vehicle park for a period exceeding 90 days in any 12-month period, nor shall the cumulative occupancy of such persons of different spaces within the same recreational vehicle park exceed a total of 90 days in any 12-month period. C. The recreational vehicle park manager shall maintain a log of the names of persons and dates of occupancy of spaces. The log shall be made available to a code enforcement officer of a question arises as to compliance with these occupancy limitations. (Ord. 441 § 1, 2000). I really do not grasp all the regulation quotes that you are writing into your comments. In other words, I do not sweat the small sh*t. Why should you? Mr. Ed, there are certain ways to get around those regulations, but it may take putting out a little money by George each year. Those same regulations exist in Florida. 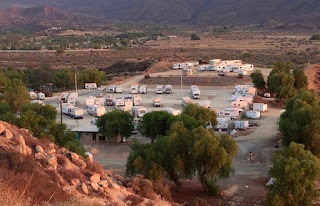 What happens is there is cooperation between George and the RV park to tow the camper (for a charge, of course) to the RV park's storage area for the two-week duration, and George may for two weeks visit with family and friends. Afterwards, the RV park reinstalls the camper back on its lot. That is better than having a surprise visit by state regulators, examination of the park's books, and a hefty fiber being paid by the park or George. George can "technically" get around the regulations. In addition, if the regulations stipulate that only George has to leave his RV for two weeks, that is an even better alternative, because the RV stays where it is, empty with disconnected utilities. I'm sorry; I meant "fine" not "fiber." By the way, Disney World in its Fort Wilderness Campground does this for its year round "campers." Of course, it is not advertised; you have to ask. I met a lady there in her 70s doing this; she just loves Mickey Mouse. Apology not necessary. I would like you to keep your comments coming. I've driven from Palm Springs over the mountain to Idyllwild. A beautiful drive and some delicious hamburgers...juicy and flavorful. We continued south to a firestation in the middle of nowhere and stopped to used their facility and they gave us a tour of the station. I've worked, as an auditor, in the area i.e. Julian, Los Coyotes...stopped to fill several water jugs of natural spring water in mountains. Can't wait to see you move into your new home!!! So excited! I'm sooooo excited too! Looks like next Spring when I'll actually make the move. Have to get to the top of the waiting list! P/S I hike a little of the PCT but warnings of a mountain lion attacking hikers kept me off the trail. I was hiking after work. Hey George, your buddy Pete is very good!! !